Is School Enough? aired September 3, 2013. 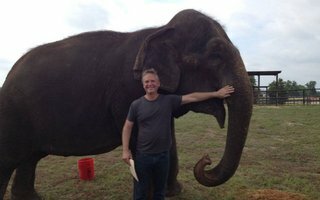 Producer and director Stephen Brown on location with Rosie, a retired circus elephant. Through the voices of these inspired students and America’s foremost education thought leaders, Is School Enough? provides insight into an essential new understanding of what education can be in the 21st century. Is School Enough? is the second in a series of programs about kids, digital media and education. The first program, Digital Media: New Learners of the 21st Century explores students claiming digital media as a means of connecting, communicating, creating, and learning, while interpreting its importance and providing a window into 21st-century education. in association with Mobile Digital Arts. PBS Video: Is School Enough?